The Awesome Awards provide an opportunity to celebrate the human spirit, community, reciprocity, generosity and all things awesome! Launched by Eclipse Awards to commemorate the 15th anniversary of working with wonderful people doing amazing things, The Awesome Awards were created to spread happiness by appreciating and celebrating the unsung heroes in our communities that are quietly going about their work and making the world an awesome place! Recognition is a powerful yet often overlooked way of celebrating people and letting them know that they are appreciated and valued. Think of recognition as a big hug from your community - when people are recognized, they tend to feel engaged, inspired, energized and confident. We can build a better world, by recognizing and celebrating the people and qualities that we think are awesome. Recognition is a great way to bestow confidence, cultivate leadership, build social capital, and make people happy! 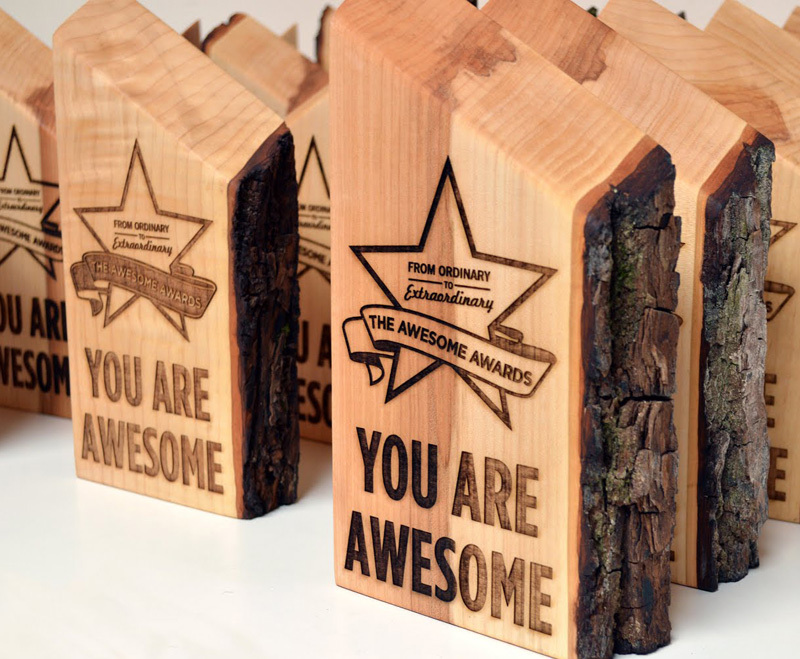 To celebrate awesome, it helps to be awesome - so the Awesome Awards themselves are both spectacular and unique. To begin with, each award is handcrafted from locally reclaimed wood because let’s face it, beautifully repurposed organic materials are awesome. As well, did you know that many of the Awesome Awards can be rejoined seamlessly because they were cut from the same salvaged maple tree? The awards are then cured in a special way that allows them to retain their natural bark edge Lastly, we etch each award before naming it something unique and sending it on its journey. Each Awesome Award is a labour of love and a thing of beauty! The Awesome Awards are organic, durable and beautiful - just like the people they are celebrating! We hope that the awards will provide you with an excuse to celebrate one another and to share the joy of appreciation. Our dream is that these acts of kindness will inspire other acts of kindness and that the ripples from the Awesome Awards’ journeys will spread happiness, gratitude, inspiration, and positive energy!